I’m a big believer in dating. The excitement, the energy, the getting dressed up and primping for the other person… And then of course the actual experience of having time together, knowing smiles and flirting across the table, brushing hands and fumbling fingers. In particular, I don’t think married people date enough. Don’t misunderstand me, I mean each other, of course… I think the best thing my husband does for us is make a big deal about dating and special occasions. He is thoughtful and makes me feel cared for and cared about. He’s shared his wisdom before in this post and this post we co-wrote, but here are some ideas that don’t cost a lot of money and can make all the difference. 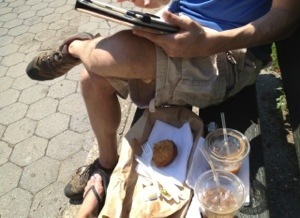 Grab a couple iced coffees and your favorite baked goods, find a park bench and your favorite board game — ours is Scrabble on the iPad (see lead image). Some backstory: when my husband and I first started dating, he told me the story about when he was a little boy his father used to take him to hotdog stands for lunch when they would come into the city. Traditional hotdog stands are rolling carts docked under a yellow and blue umbrella. To avoid telling my mother-in-law that they went to a hotdog vendor for lunch, the term “umbrella room” was born. Just across the park from us is the Metropolitan Museum of Art. Come springtime, the Costume Institute opens their annual exhibit and this year the theme is Punk: Chaos to Couture. I’m dying to go. 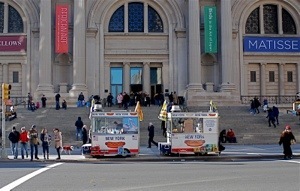 Parked at the bottom of the regal steps of the museum are always scores of umbrella rooms, selling hotdogs, pretzels, ice cream… (see featured image above) Sounds like a blast, doesn’t it? 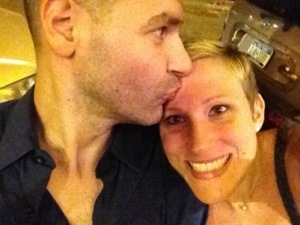 Remember when we were single and a first date was an after-work drink? Well, it’s kind of like that except you’re both going home to the same place, and you could even protract it by taking a long walk home. Seasonal and local events happen all the time under your nose. Google is a great way to find them as is your PTA, local news and sites like TimeOut.com. I also like Amazon Local to find low cost deals for everything from restaurants to classes to entertainment and travel. There are others, Groupon is another option as is LivingSocial. I’m not getting crass. This is for the married folk with kids. Why? When bedtime for the little ones comes around a routine sometimes takes over and a couple will crash in front of the TV or one will go one-way and the other will go another to different rooms and/or devices and further disconnect from each other. This is prime-couple time! You could wait to have a late dinner, or if its too late, have special dessert for just you both. Too laborious? Take a pre-bed bath or shower or give each other a relaxing massage. Who knows where it will lead… Or maybe both of you will pass out unconscious. There’s always tomorrow.